By the time of my 11pm shift on watch we were well up towards the mouth of Admiralty Inlet, sailing into a light headwind through dark and foggy skies. Night-time darkness has been a relative rarity on this trip, but at this time of year the days are growing shorter at a rapid rate. Steering a steady course under these conditions is considerably more challenging, since there are no landmarks to serve as guideposts. Instead of being guided by a landmark, it was necessary to be guided by the wind, which proved considerably more difficult for a landlubber like myself. Unused to the slow response to direction changes from the helm, I found myself continually oversteering, and zigzagging back and forth. Grant, our captain, patiently guided me in developing the right touch, and anticipating the changing orientation of the boat, the sails and the wind. With some practice, I gradually managed to reduce some of the wilder swings of direction, but have a long way to go before I can claim genuine competence in this regard. The low visibility compounded the challenge of avoiding the “bergy bits” and “growlers” – fragments of icebergs that, although small, are nevertheless best avoided. When you’re in a small boat in a cold ocean and many hours away from any possible rescue, the last thing you want to hear is something crunching against the hull. All in all, despite the flat homogeneity of the terrain, it’s very difficult to fall asleep at the helm; there’s always something to watch out for. My next shift was at 7am, and by then we were in Lancaster Sound, sailing through waters that were flat calm. Lancaster Sound was failing to live up to its fierce reputation. We were sailing on autopilot and my task was the relatively simple one of spotting and avoiding the occasional pieces of ice. I had the time to think about where we are. Anyone who has gone through the Canadian school system will have heard countless stories about the search for the Northwest Passage and its role in the European colonization of this vast continent. Lancaster Sound is the eastern opening of the Northwest Passage, although it took numerous voyages to establish that it would prove necessary to cross over the top of Baffin Island, since Hudson Bay offered no practical western passage. Lancaster Sound is a vast channel, more than forty nautical miles wide, and must have been a formidable challenge for Inuit hunters to cross on foot or by kayak. However, it was attractive to these rugged hunters since it’s abundant in whales, especially the legendary narwhal (although they’ve proved elusive to us!). Today, Lancaster Sound is the site of a proposed National Marine Conservation Area. 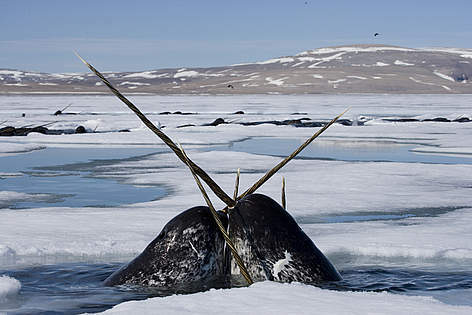 Further research and consultation with local communities will be required before this conservation area is formally established, but it will provide important protection for the narwhal, beluga and bowhead whales that spend their summers here. Moreover, Lancaster Sound could provide the southern foundation for a vast multi-zoned complex of special management areas, aimed at conserving ecosystem resilience in a rapidly changing Arctic environment. While summer sea ice disappears from much of the Arctic, and the period of annual ice cover shrinks dramatically, the high Arctic of northern Canada and Greenland – the ‘Last Ice Area – is likely to become increasingly significant in providing secure habitat for ice-dependent species. Conserving this habitat – while allowing for responsible development – provides Nunavut and Greenland with a unique opportunity to demonstrate Arctic stewardship.